Every summer an unusual-looking moth visits the gardens around our home. At first glance the moth could be mistaken for a hummingbird as it flies about, hovers, and feeds at flowers much like the Ruby-throated Hummingbirds that share the garden. The likeness might be so realistic that it even fools some hummingbirds, who sometimes dive-bomb the moth and drive it away from the flowers. 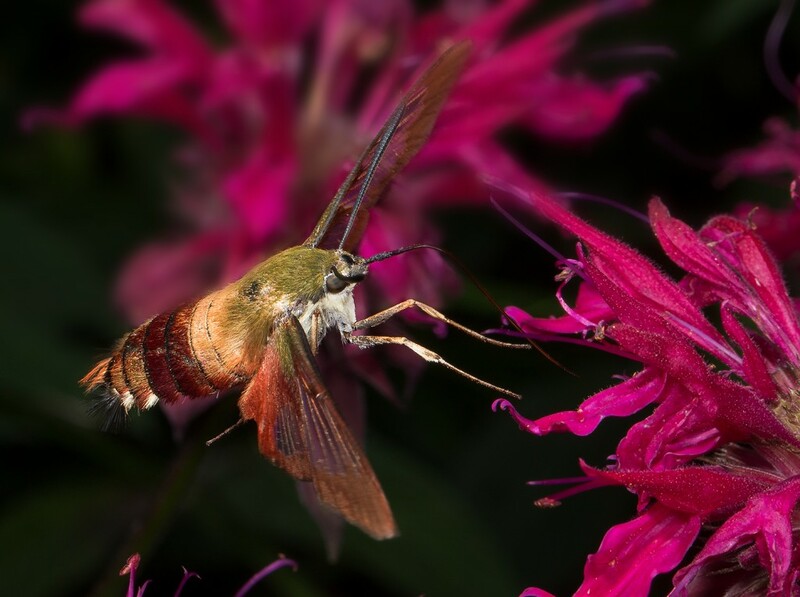 Unlike many flying insects, this moth, the Nasso Sphinx Moth, sometimes called a Clear-winged Moth or Hummingbird Moth, is fairly easy to catch in flight. If you move slowly it is possible to get quite close, certainly within frame-filling distance with a 100mm macro lens. That’s the easy part. What’s tough is getting a moth sharply in focus, for they only spend a second or two at each flower before moving on to the next flower, which might be inches or several yards away. There’s at least two ways to try catching these moths in flight, and I’ve used both. Years ago, I’d often simply aim a macro lens at a particular flower and wait, and when a moth finally visited that flower I’d snap a couple of frames. Sometimes I’d have to wait a long time, and to be honest this was a pretty boring way to shoot this moth. The more exciting and dynamic way, and certainly the method that produces far more images, is to go after the moths. As I said earlier, if you move slowly enough it is fairly easy to get quite close, and if you pay attention, you can often anticipate the flowers the moth is likely to visit next. The moths move fast, and TTL flash is needed to stop the action while also providing a small aperture for good depth of field. While TTL flash could be accomplished in several ways, I’d suggest using a twin flash system, available for both Nikon and Canon. Two flashes have the potential of providing more even and natural-looking lighting, and the small twin flashes are ideal for this since the flash units are small and relatively light weight. The same lighting could be achieved with a traditional hotshoe-style TTL flash, but at the cost of a lot more weight. I mounted the two small Canon twin light flashes on the Really Right Stuff FR-87 QR Flash Bracket, with an extra B87-QRFM Flash Mount to mount the second flash. I like to attach my small flashes to a Stroboframe mini-flash bracket, which functions similarly to a dove-tail mount on a RRS tripod head, as this allows me to quickly attach or remove a flash. Although I started with the FA-QR200 snap adapter to mount the Stroboframe to the flash mount, I didn’t have a good fit, and the Stroboframe ended up screwed on at an angle. I worried this might eventually strip the threads, or the Stroboframe might fall off. By switching to the FA-QR2, the General Adapter, I had a slightly wider platform for the Stroboframe, and the rig screwed in securely. That setup worked so well that I used Loktite to permanently attach the FA-QR2 snap adapter to the Stroboframe. This setup doesn’t compromise the Flash Bracket, and by using the quick release snap on the Flash Mount (B87-GRFM) I can switch the Stroboframe-dedicated snap adapter for one or two FA-QREX2 Flash Extenders to increase the reach of the flash. That wasn’t necessary for the Sphinx Moth, but the Flash Extenders have come in handy when I’m photographing frogs and can’t get as close. The Stroboframe-dedicated snap adapters fit on to the Flash Extender, too, so the system is quite versatile and very quick to set up or change. A Canon 1DX camera with a 100mm macro lens isn’t very heavy, but after ten minutes or so the weight does become an issue for me, especially when there are flashes and brackets attached as well. Unless I’m just going out for a quick couple of snaps, I’ll support the whole rig with a RRS monopod and a MH-01 Pro monopod Head. I’ve tried using a traditional ballhead and while it does work, honestly it was a pain, as gear may flop down or to the side when the ballhead is loosened for following a subject. The dedicated monopod head doesn’t flop, and with just front/back tilting the camera is quite easy to control. Leveling, if needed, is accomplished by loosening the lens tripod mount and rotating the lens on axis. A summer garden or a neighborhood field offers a lot of macro potential, and late summer is the ideal time as most species are at full size, ready to mate and lay eggs, many of which will not hatch until the following spring. The Sphinx Moth is just one of hundreds of potential subjects, and with the macro flashes and mounts there is a variety of options in lighting. Check it out! Copyright ©2014 Joe McDonald. All Rights Reserved. Nice work and a great write up too. Would be nice to see picture of camera rig.